Steelcase Think Chair (R) - 3D Knit Back (SC465THINK3D) at Pure Design / Seating / Workspace ::: Furniture for the Home, Office, Home Office, and More at Pure Design Online! The redesigned Think chair; a chair intelligent enough to understand how you sit, and adjust itself intuitively. The Integrated LiveBack(tm) System conforms to your body and moves with you as you change postures. It features an advanced weight-activated seat that recognizes your body's weight and adjusts accordingly, so anybody can get comfortable quickly. The intelligent design allows the user to further personalize their comfort through a few manual adjustments, but they don't require a manual to explain. 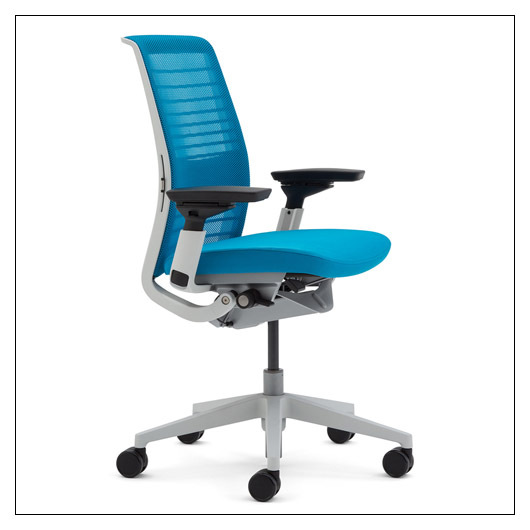 Think's built in lumbar allows for additional dialed-in back support. The 4-way adjustable arms provide support for your arms, wrists, and shoulders in a variety of postures. Think is an icon of sustainable design and the new Think pushes sustainability even further. This version of the Think comes with a 3D knit back. Choose a matching Cogent:Connect seat color, or mix-and-match back and seat with a choice of Cogent:Connect or Buzz2 fabrics. Cogent:Connect (a Circular Knit weave) has more stretch/breathability than Buzz2 (a Dobby weave), and less texture. Both yarns are antimony free and made in USA. Colors are representative and may vary slightly from actual material. Please allow an additional 1 - 2 weeks to ship. This item can only be shipped to street addresses in the contiguous 48 United States.